On a night when there was no pizza to be found in the dining hall (a very sad night indeed), I struggled to put food on my plate that seemed appetizing. And then – genius struck. I could make my own pizza! I poached some marinara sauce from the spaghetti station while I waited for my bagels to toast, and asked the grille for two slices of cheese. Just a few minutes later, I was enjoying my pizza bagel while my blockmates drooled in jealousy. Soon, they too made their own pizza bagels, and together we marveled at how delicious they are, yet so easy to make. So the next time you are at a loss for what to eat for lunch or dinner, consider the pizza bagel. It won’t let you down! Toast the bagel until it is well-toasted (a little more than golden brown). You want to ensure that it will not get soggy when you put the marinara sauce on it. Then, add the marinara sauce, about a spoonful for each half, or more depending on your preference. If you are adding toppings, place them on top of the marinara sauce. Place one slice of cheese on each half. Put the prepared pizza bagel into the microwave for 20-30 seconds or until the cheese is sufficiently melted. Wait for the pizza bagel to cool for as long as your self-control will allow you (no more than a few minutes though, thank god) and enjoy! A simple, flavor-filled dish to add a bit of color to any meal. 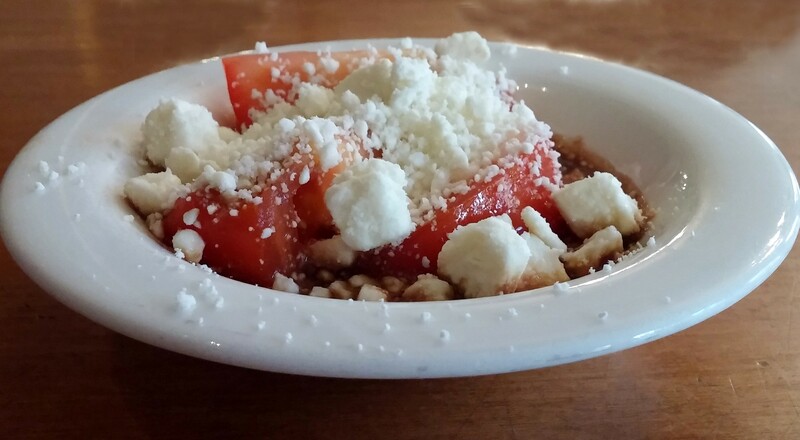 The textures of crumbly feta cheese and plump tomato contrast nicely, and the zesty balsamic is the perfect finishing touch. Select tomato wedges and place in bowl. Drizzle with a dash of oil and a hearty dose of balsamic vinaigrette.